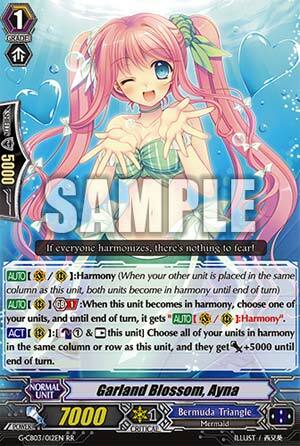 [AUTO](VC/RC):Harmony (When your other unit is placed in the same column as this unit, both units become in harmony until end of turn) [AUTO](RC) Generation Break 1:When this unit becomes in harmony, choose one of your units, and it gets "[AUTO](VC/RC):Harmony" until end of turn. [ACT](RC):[Counter Blast (1) & [Rest] this unit] Choose all of your units in harmony in the same column or row as this unit, and they get [Power]+5000 until end of turn. Ayna is all about the gainz, giving the either the column or row she's in 5k. Naturally, she'll mostly be behind your Vanguard for best effect to make your whole backrow beefy, but if she's in a rearguard column, you could use her effect, bounce her to hand with G4 Lauris or Lucky Rise and recall her, since the boost from her ability won't go away if she does. This effect isn't attached to Gen Break either, so if you go first, you can use this unit to make some columns force 15k shield from your opponent, before they can amass cards in hand. Ayna's actual Gen Break ability is nice utility; you can hand your G2 Spicas and Emilias the Harmony keyword to set up your effects better. This also opens the route to allow non-Harmony focused decks (like the subclans) the option to utilize G4 Lauris. Experiment to your heart's content. Just don't spam Ayna too much. You still want to have counterblasts to make perform 4+ attacks on your turn with Spica and Olyvia. Replaces a vanilla Harmony G1 in the deck. Shame about how she eats bounce fuel.